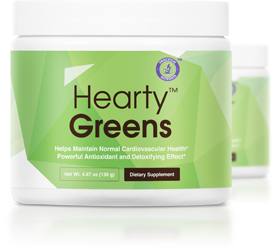 Hearty Greens is designed to support your cardiovascular health by helping your body combat oxidative stress on a cellular level. Your satisfaction is most important to us, so we want you to feel completely secure in your purchase. That’s why all our Princeton Nutrients products are backed by an industry-leading 90-day Money-Back Guarantee. If you’re not happy with your product, for any reason, you're covered by our 100% money-back guarantee (less shipping & handling) for 90 days. For returns call 1-866-427-3019 and we'll issue your refund immediately. No-questions asked. Q: What's in Hearty Greens? 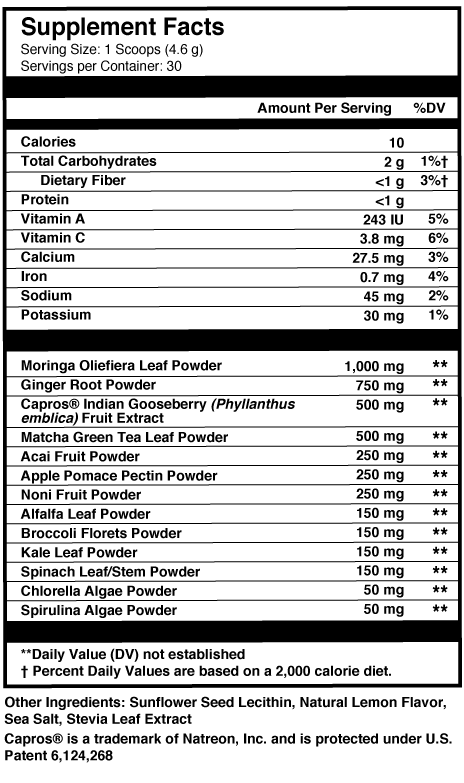 Hearty Greens contains Alma Extract, Moringa Leaf, Matcha green tea leaf, and a Super Foods Green blend of 10 potent plants and vegetables. These powerful ingredients have been shown to help combat oxidative stress, activate more energy, and support your cardiovascular health, as well as your overall health. Q: How should I take Hearty Greens? Simply mix one scoop of Hearty Greens with an 8-oz. glass of water, and drink once a day. Hearty Greens dissolves quickly and has a delicious, refreshing taste. The ingredients in Hearty Greens are fully bioavailable, and once absorbed in your stomach will go to work boosting your cellular health all day. It is not necessary to refrigerate Hearty Greens, although doing so will not impact its effectiveness. Absolutely. We provide an industry-leading 90-day money-back guarantee on every Princeton Nutrients purchase. If you're anything but satisfied, return your order for a full refund of the purchase price. Q: Can I buy Hearty Greens in stores? The answer to this one is "no." We deliver Hearty Greens straight to you, cutting out the middleman so you save money. Disclaimer: †These statements have not been evaluated by the Food and Drug Administration. This product is not intended to diagnose, treat, cure or prevent any disease. Use only as directed. Consult your healthcare provider before using supplements or providing supplements to children under the age of 18. The information provided herein is intended for your general knowledge only and is not intended to be, nor is it, medical advice or a substitute for medical advice. If you have or suspect you have, a specific medical condition or disease, please consult your healthcare provider.